The Rotating House of K�rmeling is a permanent public art work, located on the Hasselt roundabout, at one of the main entrance to the city of Tilburg. A detached house with a front and back garden is located on the Hasselt roundabout. 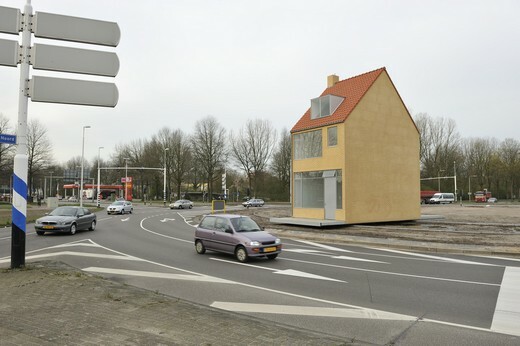 The house, which looks real, is rotating on the roundabout in the direction of the traffic and completes one full circle in 20 hours. The house is a full-scale model (5 meters wide, 8.5 meters deep and 10 meters high). It is not fit for human habitation; it consists of a steel construction covered with red brick strips and tiles. The windows are made of laminated glass with white window frames. The front and back gardens are made up of artificial turf. At night the house is illuminated from the inside. The house is closed but, with a key, you can enter the house through the front door for potential maintenance. Grass grows on the roundabout itself. The distance between the garden and the road amounts to a meter. The house has 4 track wheels placed on rails. The mechanism is driven by four wheels with 24 Volt deriving from a solar panel. Another mechanism ensures that the house automatically stops as soon as something bumps into it. In explaining his design John K�rmeling states that he wants to provide drivers waiting at the roundabout with a feeling of alienation from reality by having the house rotate. Normally the driver is moving while the construction stands still. The alienation effect will, however, not be immediately perceivable. After all, the house only rotates very slowly (once all the way around in 20 hours). If you return at a later time you will experience this ?disconnection? from reality because the house has moved. Moreover, the work offers a commentary on the construction of the Hasselt roundabout itself which created a gap in the integrity of the historic belt of Tilburg in the sixties and separated Hasselt Street from the Chapel of Hasselt, a much frequented chapel to the virgin Mary and an important cultural-historical site .